"It is this very special sound by Viktoria Kaunzner that makes this album so unique. It is evident that the violinist also composes. And with what skill! Conclusion - an extraordinary album one must listen to!" (Naxos, 2015). "Fearless playing, bell like tone", "A violinist with a questing mind" (The Strad, 2015). "...Stunning", "peerless", "eminently musical performance" (American Record Guide, 2015). 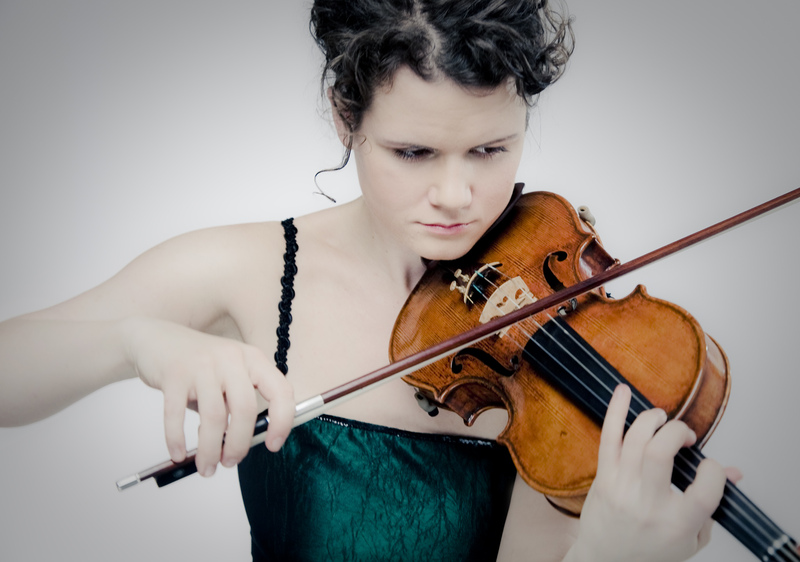 The Süddeutsche Zeitung wrote of Viktoria Elisabeth Kaunzner (*28.05.82 in Deggendorf): "Her skill on the violin is brilliant, her musical ability tremendous," while the Augsburger Allgemeine Zeitung (AAZ) wrote: "Notes like liquid gold." As a composing violinist, versatile artist and poet she is therefore an "exceptional phenomenon in the new music generation" (Passauer Neue Presse). Lord Yehudi Menuhin praised her playing as "brilliant". In 1995 she gave her solo orchestra debut on radio with the Symphony Orchestra of Plzen. Back then she was also performing with the children's folk music ensemble "Úsmĕváček" ("little smile"). After finishing top of her senior school class in her hometown of Viechtach in the Bavarian Forest (where her main subjects were Latin and maths), she studied with Prof. Josef Rissin in Karlsruhe. She received her diploma at the Hanns Eisler College of Music in Berlin from Prof. Stephan Picard. She did her master of violin solo degree with Prof. Zakhar Bron in Cologne and gained the top mark. She has won prizes at the World Federation of International Music Competitions and at the instrument fund competitions of the German Musical Life Foundation in Hamburg. She received scholarships from the German Academic Exchange Service (DAAD), and from Erasmus and the Gerd Bucerius Scholarship from the ZEIT Foundation, and she honed her skills at locations like the CNSMD in Paris, at the Lucerne College of Music and at the Starling Delay Symposium at the Juilliard School in New York. She has also studied the Baroque violin. She gained important input to her career from music personalities like Ana Chumachenco, Itzhak Perlman, Antje Weithaas, Igor Ozim, Igor Oistrakh, Ida Haendel, Ivry Gitlis and HanAn Liu. She has performed violin concertos by Bach, Barber, Beethoven, Brahms, Brown, Bruch, Mozart, Mendelssohn, Sibelius, Spannheimer, Tchaikovsky, Wieniawski with orchestras including the Jena Philharmonic, the Radio Symphony Orchestra Plzen, the Passau municipal orchestra, the West Bohemian Symphony Orchestra of Mariánské Lázne, Ensemble 20/21 of the College of Music and Dance in Cologne, the Cheongju Philharmonic Orchestra, the Chile Regional Philharmonic, the Film Orchestra Babelsberg and the Erasmus Ensemble of the Mozarteum in Salzburg. As a chamber musician she works together with other musicians including Alfred Brendel, Stefan Temmingh, Hansjörg Schellenberger, Oleg Poliansky, Elena Nesterenko and Xavier Bouchaud at venues like the International Music Festival Santander, the Mecklenburg-West Pomerania Music Festival, the Lausanne Festival, and the 2 Days and 2 Nights Festival in Odessa and performed e.g. world premiere of Krzyzstof Meyer´s 13th string quartet with the Sinus Quartet at the International Shostakovich Festival in Gohrisch. She was the soloist on a tour with the EuroArab Classical Orchestra, where she improvised with Arab musicians. She has led the Berlin Philharmonic Festival Orchestra in Zermatt and was guest leader with the Korean Broadcasting Symphony Orchestra in Seoul. She has performed with conductors like Daniel Barenboim, Christian Thielemann, Michail Jurowski, Marek Janowski and Yakov Kreizberg. In 2003 she formed the Duo 47/4 violin-harp ensemble with the harpist Anna Viechtl, and their debut CD "Wild Bird" was released on the Munich-based Oehms Classics label in spring 2015. Viktoria composes and is very keen on improvisation, performance, and new music. She has been a member of the Cologne-based new-music Ensemble Garage since 2009, taking up an invitation to the 2014 Darmstadt Vacation Courses for New Music. She has attended composition courses given by Salvatore Sciarrino, Katja Tchemberdji, Rebecca Saunders and Peter Aderhold, jazz with Maria Baptist, theory with T. Daniel, A. Bolay and also media composition. She has had many works dedicated to her. Alongside the compositions of J.S. Bach she loves the music of Nikolai Medtner. In 2010 she was appointed by the Franz Liszt College of Music in Weimar as a professor of violin at the German School of Music Weimar at the Kangnam University in South Korea. She gives master classes in Germany, Korea and the Near East, including at the Fundación Barenboim-Said, and is Artistic Director of the Violin Special Masterclasses, a mobile violin festival. Her artistic oeuvre has been documented by many broadcasters including Bavarian Radio, the WDR broadcasting corporation, DeutschlandRadio, Bavarian Television, ARTE TV Korea, KBS and Ucrain TV. Since 2013 she has been playing the Ex-Midori Guarneri del Gesù violin for exceptional events – mentored by Florian Leonhard Fine Violins London. In 2014 she recorded all solo sonatas by Eugène Ysaÿe on this wonderful violin and additionally her solo piece “Sojuchameleon” for a courageous violinist. In spring 2015 she released her solo CD album “Ja(zz)smine Rice – Violin Mysteries” at the Solo Musica Label, Munich. During her student days she learned Russian, Hebrew, Spanish, Arabic, French and Korean and is at present taking a distance-learning university course in poetry writing. She has been published in "The Strad" magazine and the Neue Musik-Zeitung and she wrote the violin satire "K: Ökokauz", which she has performed in various locations including Munich and Seoul. She lives in Germany and South Korea.